There was a condition of listening I failed to mention in my previous essay, that being: how do our other senses come into play? Mainly because it a complex system and for convenience we talk about the senses as separate individual, isolated experiences. This is for the sake of clear communication, for clarity’s sake; though in terms of art, it could be argued that art requires the repression of other senses. This has created a bias towards looking at things. Even though the experience of art is a bodily action — and nothing focuses on that more than the current Hayward Touring exhibition at the Bluecoat, Liverpool. Fresh from Baltic 39 in Newcastle, and due to tour Sheffield and Norwich, this is sound artist Sam Belinfante’s Listening. The exhibition is built from work which explores the relationship between experience, perception and sound. 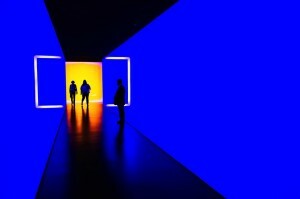 It always surprises me when interacting with a sound installation that people adopt the ‘sound art pose’: eyes closed, head cocked to one side. This is to concentrate on the noise being produced, yet I feel that it removes a vital element of sonic art which is its ability to make you revaluate, and reconsider the space you’re currently inhabiting. 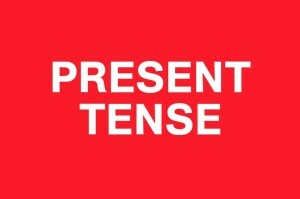 This effect, the overlapping of sense, is keenly felt within the Bluecoat’s ground floor Vide space. Which is now bathed in an eerie and briny-green glow. As you enter, you are aware of ethereal vocalisations, whose reverberations belong to this space. This is Raganar Kjartansson’s Song (pictured above), where sirens sing a song of entrapment and yet appear to be entrapped themselves. Their presence, however, is at once spectral and yet tangible. Like the accompanying text by Hannah Rickards, which offers a place activated by imaginary sound production. References to real and imaginary spaces, a collage of expected sounds, a playlist prompted by the text. Almost invisible within this space is Katie Paterson’s Dying Star Doorbell: visitors have to push a door open to hear a cracking sound, which is over as soon as it is heard. This is a sound of a dying star — something which we are only able to hear due to technology. Even though it may appear to be slight, it offers an insight into the banality of death within the vastness of the universe. Past the nominal soundscape of the everyday into another world. When I enter this dark space, I am surrounded by a thunderous noise, which could be thunder; equally it could be water rushing or wind blowing. The sound seems at odds with the sedate and polite looking pillows and matting on the floor. It’s an awkward social encounter that makes me evade an answer: I will have to visit Mikhal Karikis’s SeaWomen (2011-12) again. 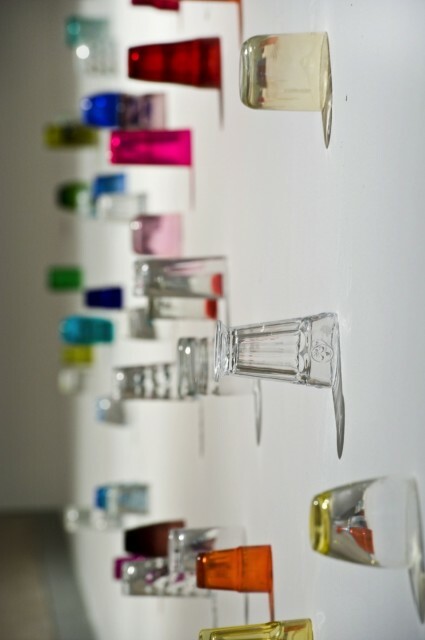 Now I approach the bright collection of drinking glasses glued to a wall that is Amalia Pica’s Eavesdropping (2013). Which gives everyone the chance to break into someone else’s privacy, like nosey neighbours in old sitcoms. What are you actually listening to? Is it the air circulating around the glass, or the deep rumbling of yourself, or can you actually hear a distant thump? Behind that wall, what do you find? A number of objects all wanting your attention. There is a discobox pumping out a ‘phat’ beat, a beat as enchanting and unattainable as any siren’s call. This is Prem Sahib’s Taking Turns (2013), which at a certain points offers a strange nostalgia for a good time you never had. Sharing this space hangs a spiky foam cube and what looks like a dim blue star turning. Then, with thunderous silence, the lights go out and everything becomes theatrical. These are pieces by Turner Prize winner Laure Prouvost, who through sound and light and playful tone of voice gives inanimate objects their own inner life. Light lands with a silent thud and you’re facing Christian Marclay’s Soundholes: a selection of photographs of buzzer grills that called to mind a dozen shrill and harsh tones, each attached to metallic voice and stilted conversation. By the side of the Soundholes and by your feet is that dim little star you saw earlier. Haroon Mirza’s Cymbal looks more like a lightbulb attached to a cymbal: it rotates past an AM radio where its gives out enough signal for the radio to buzz. Like Paterson’s dying star and Anri Sara’s experiences of constantly shifting radio waves within a truck park (Air Cushioned Ride (2007)), these pieces are reminders of the effect of creating things to listen to has had on us and our surroundings. The world is now full of noise. It always surrounds us and threatens to overwhelm us, and if we think about it, this could be our sublime, a very contemporary sublime. Moving from the external world to the internal. A chance to realise a bodily experience of listening and to share it with another. In Laurie Anderson’s The Handphone Table (2001), the social space of a table becomes the conductor for sound, vibrating through your bones and the bones of the stranger who is sitting opposite you. As a whole, a playful democratisation of space and experience. Then there’s Cardiff-Miller’s Cabin Fever (2004). Like an audio ‘what the butler saw’ machine, after peeping through a whole and putting on some headphones, you’re trapped in snowy cabin. A prime example of how sound is used to create a solid fictitious world, I won’t say too much — it will spoil the experience. The third name in the space is Max Neuhaus: the godfather of sound art. Here represented by archive materials and no audio, this may seem at odds with the general theme of the show, but as Neuhaus’s piece are so intertwined with the space they inhabit, it is probably a wise choice not to hear them here. You could always go to Time Square. There are other works in this space: a thunderclap has been recorded, taken apart, orchestrated and replayed and sounds like it should (Hannah Rickards’ Thunder (2007)). We also have Lina Lapelyte’s O: appearing to be a record that records its own existence, the effects of its own ageing. Upstairs is The Whisper Heard (2003), an installation by Imogen Stidworthy. Where sound is being bounced around, disconnected from its source. Within the echoes is the exploration of how this noise we make called spoken language forms and shapes our identity. As the voice bounces around, you get the sense that this thing called language, this thing called identity, is built from many fragile elements. On the way out, you stop and pick up the red phone sat next to the potted plant. A voice speaks: you recognise it, for it is the monotonous voice, the clear and steady voice, a voice with no allegiances. 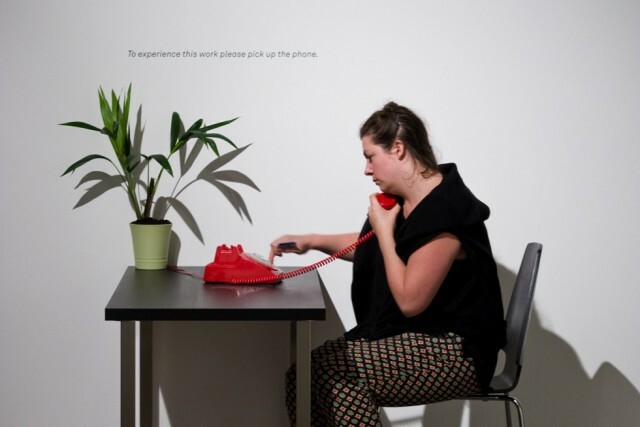 The voice of Carey Young’s Follow the Protest (pictured above) is the telephone call centre voice: nearly human, not connecting you, but keeping you at a distance. This exhibition has been a poetic, playful exploration of the body’s place in the act of ‘listening’, of the complex relationship between the physical experience and the imaginative life. The role that listening has to play in the definition of the world around us and how it connects us to each other. I may be biased towards this kind of work, but still I found it engaging and stimulating and I’m curious to see how people interact with it over the coming months. Whether it can break the hold looking has over visual art; encouraging the audience to engage wholly and bodily with it.